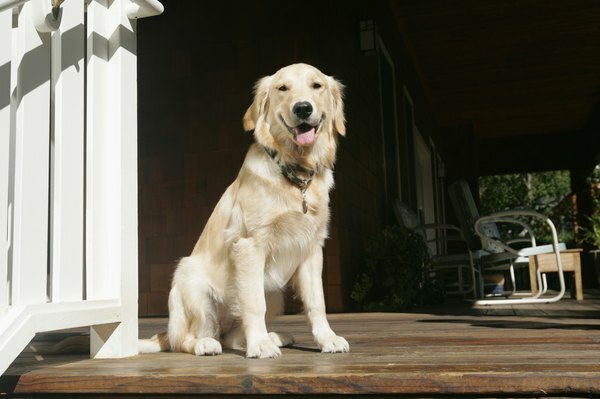 A doggie door allows your pup to go in and out without interrupting you. If you let your dog in and out multiple times a day to do his business or play in the yard, you may want to build a doggie door. A few supplies and basic carpentry skills are all you'll need to give him his own personal entrance. Measure your pup to find out what size doggie door you need to make. It should be at least 2 inches wider than his shoulders and 2 inches taller than the distance from the bottom of his chest to the top of his shoulder blades. Draw the outline of the doggie door with a pencil and a level on the door you'll be cutting. Make sure it's at least 3 inches above the bottom of the door and centered. Drill a hole into each corner of your outline. This will help you get your jigsaw cut started. Cut through the door along the outline, from drill hole to drill hole in a straight line. This will be the opening for your new doggie door. Cut the rubber mat into two pieces 2 inches taller than the doggie door and the same width as the doggie door. These flaps will serve as the door portion of the doggie door. Cutting them too large is better than too small if you are unsure of the fit; you can always trim the extra length off when you're done with the project. Cut strips of wood to frame the opening of your doggie door for both sides of the door, which means measuring and cutting eight pieces total using a hand saw or miter saw. These strips can be simple 1-by-2-inch lumber or basic wall trim. Run a small bead of silicone along the top edge of on piece of rubber mat and sandwich it between the door and the strip of wood you are using for the top of the frame. Screw this piece of wood in place flush with the top of the opening. Drill the screws through the wood strip and the mat and into the door. Wipe away any excess silicone. Make sure the mat flaps back and forth easily, so Fido can come and go as he pleases. If the mat is still slightly too long, trim it for the perfect fit with a utility knife or scissors. Finish framing the other three sides of the opening and repeat these steps for the other side of the door, placing the second mat on the outside of the opening. Paint the frame to match the door or get creative if you want. Now that your project is complete, it may take a few tries to train your friend to use his door, but once he gets the hang of it, you'll both enjoy this new addition to your home. When cutting the wood for the doggie door frame, you can cut the corners at a 45-degree angle with a miter saw or make the corners square by having the top and bottom pieces extend out to the edges of the side pieces. The side pieces should be just long enough to extend from the top to the bottom of the hole. Wear safety glasses when using a jigsaw. What Is a Good Place to Keep a Kitten When You're Not Home?